AV-Comparatives' annual security roundup tested elements such as real-time protection, file detection, and malware removal. 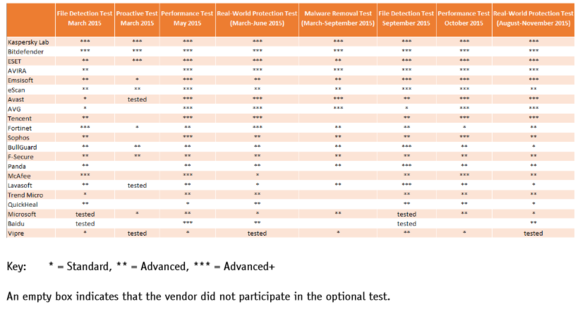 Independent antivirus testing lab AV-Comparatives works hard all year testing AV suites to let consumers know what to expect from the major service providers. The Austria-based organization just released its 2015 report rating 21 major security suites for Windows, with Kaspersky Lab taking the award for product of the year. Kaspersky won top honors for having the best overall performance across a variety of tests such as real-time protection, file detection, and malware removal. Although Kasperksy won the top spot, it actually tied with Bitdefender—but AV-Comparatives' rules against awarding a company product of the year two years in a row bumped the 2014 winner to second place. AV-Comparatives' overall test results for 2015. This is something of a trend for AV-Comparatives, as the 2013 product of the year award went to Kaspersky Lab, which is why Bitdefender won in 2014. 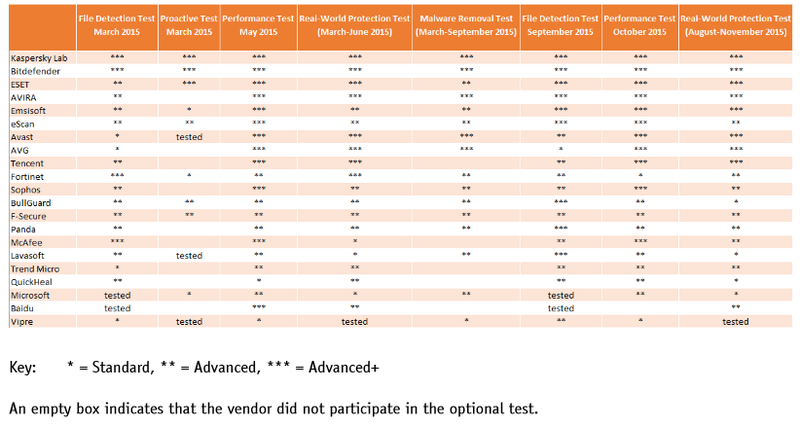 AV-Comparatives' 2015 roundup includes pretty much every name you've heard of in the world of Windows security suites, including Avast, AVG, Avira, Baidu, Bitdefender, BullGuard, Emsisoft, eScan, ESET, Fortinet, F-Secure, Kasperksy Lab, Lavasoft, McAfee, Microsoft, Panda, Quick Heal, Sophos, Tencent, Threat Track Vipre, and Trend Micro. The impact on you at home: While it probably doesn't matter to you what awards a security suite wins, AV-Comparatives' annual summary is still a good resource. First, it tells you that Kaspersky and Bitdefender are probably great choices if you're looking for a solid security suite. It can also help if you want to see how your security suite stacks up against the competition. Anyone sticking with Microsoft's free Defender, for example, can see that it's got a pretty standard score across the board. That means it works just fine, but could stand to improve its performance compared to the competition.